This is an example of the iconic Southern Railway 25 Ton "Pillbox" Goods Brake Van. All freight trains used to have a Goods Brake Van at the rear in which the Goods Guard rode. His duties varied according to the type and itinerary of the train. Many goods trains (and nearly all mineral trains) contained wagons without automatic (vacuum) brakes or a through brake pipe. The guard had to be familiar with the geography of the route and to be prepared to apply the handbrake on long descending gradients to assist the locomotive with braking; hence the need for such a heavy vehicle at the rear. Many of these vans were originally fitted with sanding gear, operated by a lever inside the van. The sand was contained in a box on each verandah. If the train stopped at intermediate stations to set down or pick up wagons, the guard was required to undertake shunting duties, coupling and uncoupling wagons. The equipment in the van included a "shunting pole" and a "brake stick" for use in these operations. The guard had coloured flags and an oil lamp capable of showing coloured lights as part of his personal equipment. When the train was in motion the guard had to regularly check that the train was in good order by looking along its length through the small windows in either side of the duckets, which contained a padded seat to reduce the discomfort from the train "snatching". One of the not-infrequent problems encountered, particularly with wagons with "grease boxes" (grease-lubricated plain bearing axle journals), was an axle journal running hot and, ultimately, the lubricant catching fire! Any wagon with a smoking or glowing "hot-box" had to be detached from the train at the first available siding. Every train had to carry a red tail lamp to indicate to signalmen and station staff that it was complete. 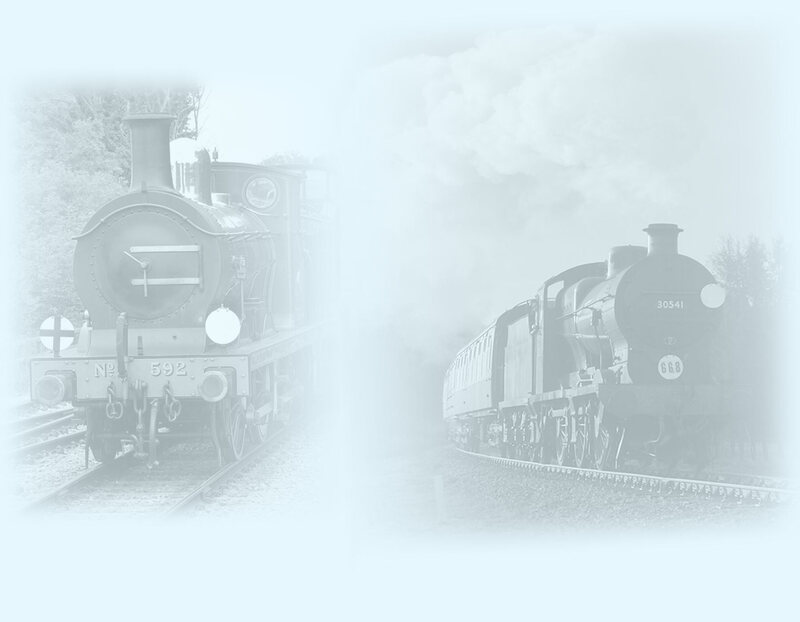 If the train contained "unfitted" wagons, the van would also need to display a pair of side-lamps showing a white light forward and a red to the rear. The purpose of these was to indicate to a member of the loco crew looking back that the train was complete. The guard was responsible for checking that these were illuminated. Two side lamps and one tail lamp were part of a van's equipment. Between his duties, the guard was kept warm (draughts permitting) by the small coal-fired stove, which would also keep a tea can warm. Inside the van was a coal box. This brake van is a development of the SECR van (see 11916). The SECR pattern underframe was first fitted with the narrow body with lookout duckets positioned to the left-hand end of the cabin. This was SR diagram 1578. After 80 were produced, the design was changed with alterations to the underframe and the duckets being placed on the right-hand end of the cabin; a new diagram, 1579, was issued. 55993 was one of an order for 50 vans built at Lancing on 30th August 1930 to diagram 1579 and order L473 at a cost of £451. The steel channels which form the solebars of the vehicle were rolled at the Shelton Works in October 1929. Further vehicles were built over the years to the same diagram. Later examples (of which ARMY 49018 is a variant) had the regular bodyside planking substituted by pairs of narrower planks. 55993 passed into British Railways ownership in 1948, gaining an "S" prefix to its number. The sanding gear was removed in November 1950. With the steady demise of freight traffic and the elimination of the older wooden-underframe brake vans from departmental service, it passed into the ownership of the Civil Engineer on 18th July 1964 and the number was given a "DS" prefix. The vehicle was later fitted with a vacuum through pipe and the end windows were altered. The van was given a thorough overhaul, being outshopped in 1992 in post-1937 Southern Railway livery. The window modifications were removed and a dummy sanding lever was fitted. By 2005 the roof canvas had begun to split and leak, causing one or two roof boards to rot. At the time of writing the van is undergoing an intermediate repair and the roof will be covered with aluminium sheet, obviating the need for canvas repairs and replacement. Although it is not planned to reinstate the sanding gear, it is intended that dummy sandboxes will be fitted. The SR liveries are derived from the LSWR, including the goods brown. 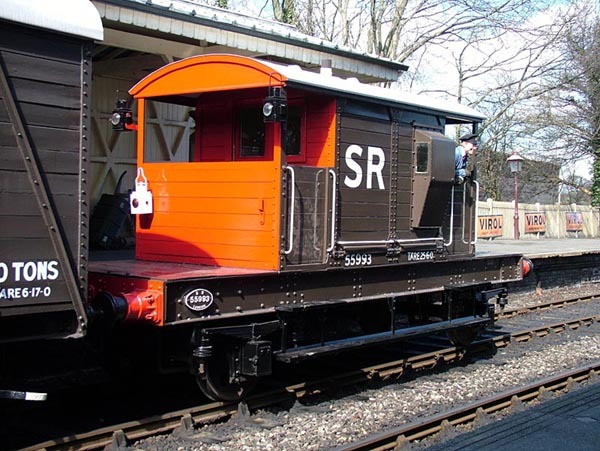 The late Gordon Weddell confirmed that the LSWR recorded its brake van end colour as VERMILLION, which is a bright orangey-red. However, the end colour as used by the SR is documented as being VENETIAN RED. So, what is Venetian Red? It is a naturally occurring pigment also known as INDIAN RED. This, a sort of slightly purple-ish red oxide, was the colour used by London Transport for the wheel hubs of its buses. Indian Red was also the colour that the GWR painted its wooden carriage droplights; perhaps a faux mahogany? However, if you are the owner of a 1955 Chevy Corvette in Venetian Red, you will doubtless believe that it is another term for Ferrarri red! The HMRS booklet on SR liveries describes the colour as, when new, "looking like Vermillion" and it recommends a vivid red colour. It acknowledges that the colour weathered and faded, and makes recommendations for modellers to represent that condition. The consensus seems to be that the end colour when new should look like Vermillion. The SR structure painting guide describes the colour used for the red stripes on the beams of buffer stops and fire buckets on stations as Vermillion. A later BR update to this replaces the Vermillion specification with Post Office Red. On the Bluebell we use Post Office Red – or Royal Mail Red – for our brake van ends. When the sun shines on it, it appears to be Vermillion. An Illustrated History of Southern Wagons – Volume Four, by Messrs Bixley, Blackburn, Chorley and King; published by The Oxford Publishing Company, 2002. ISBN 086093 5647.